You are here: Home › News & Publications › Home Page › Labour News › Get on the bus with Capers 4 Healthcare on Nov. 16th! Health Minister Randy Delorey has been invited time and time again to health care rallies and town halls held in Cape Breton to hear community members’ concerns about the ongoing healthcare crisis and the announced closure of two Cape Breton community hospitals. He has consistently chosen not to attend. Well, if he won’t come to the community, the community will go to him. 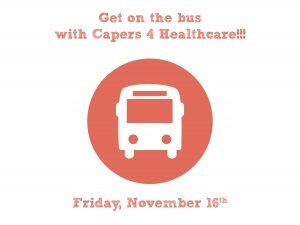 This Friday, November 16th, the community group Capers 4 Healthcare will be chartering and filling buses with citizens concerned about the future of healthcare on our island. They will travel to the Canso Causeway, where they plan to exit the buses and lead a one-lane march across. Once across, they will get back on our buses and drive to the Health Minister’s constituency office in Antigonish, where they will present their concerns and protest outside his office for several hours before returning home. Please include passengers’ names, phone number and desired pickup location. If you need any help registering call an organizer at 902-304-4626. To find out more about the crisis in health care, particularly in rural parts of the province, check out our podcast on the issue.